New arrival: Microsoft launches new Surface line-up & store in Singapore « Tech bytes for tea? 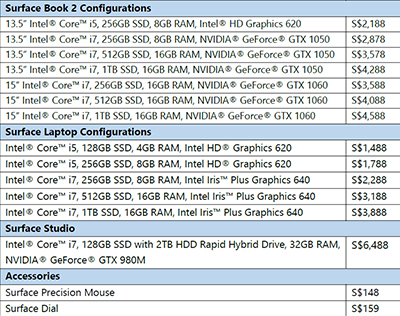 Prices and configurations for the new Surface devices. Click to enlarge. Removing the barrier between a conventional desktop and laptop, Surface Book 2 features the latest 8th generation Intel® Core™ processors and the best graphics performance yet with the latest NVIDIA GeForce GPUs. Online on the Microsoft Store, as well as at authorised retailers in Singapore including Best Denki, Challenger, Courts, LOL by Epicentre, Harvey Norman, and Newstead, both online and in-store. The line-up will also be available for commercial customers via Authorised Device Resellers including AsiaPac Distribution Pte Ltd, JK Technology Pte Ltd, and UIC Asian Computer Services Pte Ltd. Starting from S$2,188, Surface Book 2 is up to five times more powerful than the original. Surface Book 2 will be available in 13.5” or 15” options, and boasts an impressive 17-hour battery life for marathon productivity sessions. 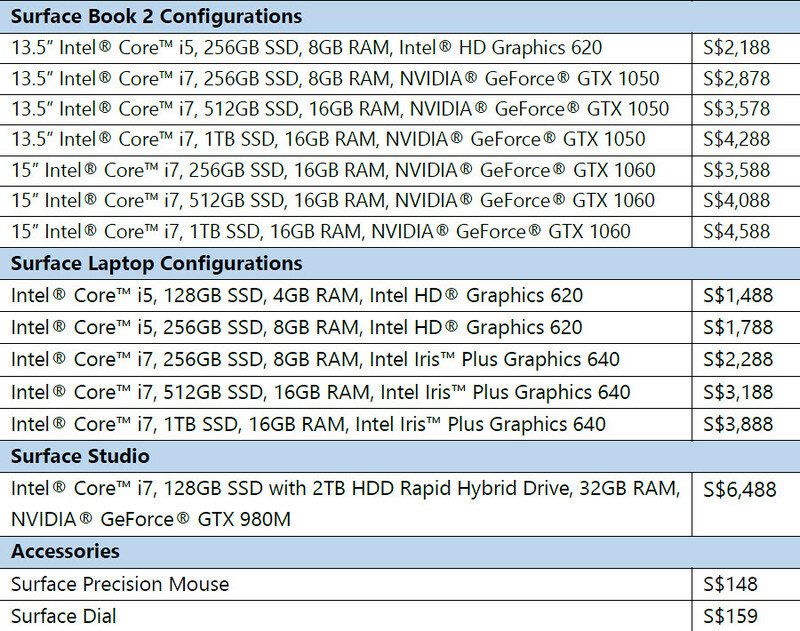 From running software such as Adobe Creative Cloud and Autodesk, to playing great games such as Forza Motorsport 7 or Gears of War at 1080p, 60fps, it is more than prepared to support users’ workload for work or for play. Surface Laptop elevates design and performance in a sleek, elegant clamshell device. “Since the launch of Surface Pro in Singapore, we have been receiving feedback from our consumers that they are looking for different forms of Windows devices to suit their varying needs. 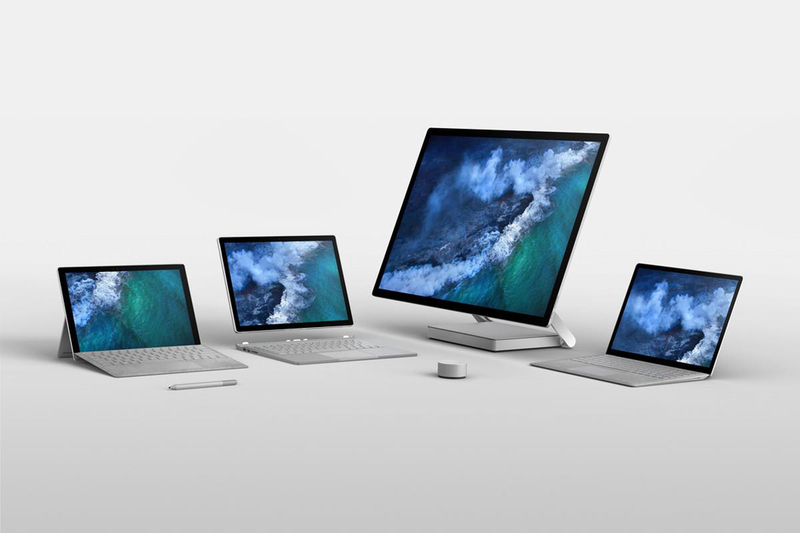 Today, we are excited to be bringing an expanded line-up of Surface devices, which brings an ultimate computing experience with the combination of power and portability, and will inspire users to bring a new level of creativity to their work. 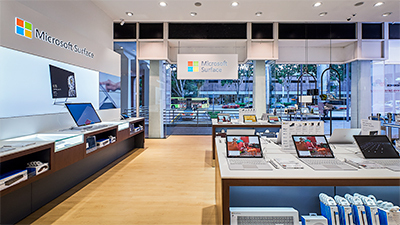 In addition, the new Surface Store in Singapore is a commitment to deliver a one-stop experience for customers to experience the ultimate Windows devices that brings the best of Microsoft in one location,” said Veronica Chiu, Windows and Devices Business Group Lead, Microsoft Singapore. More than a traditional laptop, Surface Laptop is priced from S$1,488, and is engineered to start fast and stay fast with a 7th generation Intel® Core™ processor and up to 14.5 hours of battery life to last through the day. At just 1.25 kilograms2and less than 14.5mm thin, Surface Laptop fits nicely into your favourite bag, and is lightweight for users to bring around. Surface Studio is an entirely new device designed for the creative process. Its roomy and adjustable 28” PixelSense Display coupled with the innovative Zero Gravity Hinge provides a huge canvas for all kinds of work. Pair it with the Surface Dial3 for both on-screen and off-screen experiences that enable you to interact with applications in natural ways that deliver a fluid creative process. Surface Studio will be available at S$6,488. The Surface Store at Harvey Norman Millenia Walk Flagship Superstore will open officially on 10 March 2018, and will offer a new Surface Concierge service where customers can get support for their Surface device, regardless of where or when it was purchased. Microsoft plans to add additional services to the Surface Concierge over time. Surface Dial offers a completely new way to interact with technology and create in the most natural, immersive way. This controller allows you to store, customise, access, navigate, and reimagine physical tools in the digital world – from concept to creation. Haptic feedback from the Surface Dial provides helpful vibrations to help users be in touch with their work. This entry was posted on Tuesday, March 6th, 2018 at 8:00 pm and is filed under Accessories, Desktops, Events, events, Gadgets, gadgets, Hybrid, Launch, Microsoft, Mouse, newArrivals, Notebooks, notebooks, Press Release, Prices, Shopping, Specifications, Surface, Tablets, tablets, Windows 10. You can follow any responses to this entry through the RSS 2.0 feed. You can leave a response, or trackback from your own site.